What are the most popular online bachelor's degrees offered in Alabama? Rooted in Alabama's online education offerings is the Alabama ACCESS Distance Learning Initiative, which provides online coursework across all classroom-taught subjects to high school students. The state's online learning options at the college level spread even farther since several of Alabama's largest public universities also offer a variety of distance programs. Alabama's participation in the Southern Regional Education Board (SREB) provides them greater access to working with policymakers, colleges, and schools to improve education in Alabama. This interstate consortium also tracks tuition and enrollment rates relevant to schools that offer online education programs. Between 2013 and 2014 alone, Alabama's overall enrollment in degree-granting institutions decreased by 2% as tuition increased by four percent. This shift in enrollment is counter to national trends, which show an increased number of students in higher education programs by an average of 4.5%. Despite the increased cost of tuition and decreased enrollment throughout the state, students who do choose to invest their time in online colleges in Alabama have diversified program offerings and universities to choose from. Many in-state colleges with online learning programs are still cheaper than other options, and the multitude of distance programs offered often make for a worthwhile investment in one's higher education. Alabama (UA) offers multiple distance learning opportunities that suit students’ diverse needs. Bama By Distance includes 75 programs that use non-traditional formats including online, video conference, evening, and weekend classes. Instruction is delivered online by professors using Blackboard Learn. Online and blended courses utilize two-way interactive classes and pre-recorded lectures streamed same day. Students submit assignments through email. UA offers an innovative LifeTrack program. Instead of choosing a major, adult students with irregular schedules can select from four broader study courses or design their own for a well-rounded education. Students team with a personal advisor who serves as mentor through graduation. One of the most flexible of online colleges in Alabama, The Gadsden Education and Research Center is an off-campus program serving residents of Alabama, Tennessee and Georgia with weekend, evening and summer classes. UA’s Back to Bama program is designed for previous students seeking to return to school (on campus or online) for their degree. Students at Alabama-Birmingham can take courses that are 100% online, mostly online, partly online with occasional on-campus intensives, or enroll in blended programs containing both online and on-campus classes. There are 12 online bachelor degree programs, 13 online minors, 47 online master programs, 7 online doctoral degrees, and 8 online academic certificate programs. The school is internationally known for its medical, research, and academic prowess, attracting record enrollment in 2016 of over 19,500 students. Consistently cited for its diversity, UAB welcomes students from over 80 countries. Medical students can explore potential specialties by participating in clinics, conferences and mentorship programs or joining any one of dozens of medical student interest groups and local chapters of national medical associations. Equal Access Birmingham, for example, is a student-run, free healthcare clinic serving the Birmingham community. Special online degree programs exist for active duty, reserve, retired military members, and for adults who have some college credit. High school juniors and seniors can get a jump start by taking online courses. Heritage Christian, In Florence, Alabama, offers associate’s, bachelor’s, and master’s degree programs -- on and off campus -- for preachers, teachers, and missionaries. Each program is intellectually challenging, evangelical-focused, and committed to real world ministry. All programs are available online, and coursework and graduate requirements are the same for all students. Bachelor’s degree candidates must complete 30 hours of supervised field experience; this requirement is adjusted for associate’s degree or transfer students. Ministry options might include Bible class teaching, youth or prison ministry, or hospice chaplaincy. The school’s three master’s degrees include the Master of Arts, which readies students for biblical study in Greek or Hebrew, the Master of Ministry, and the Master of Divinity program. Online graduate students need to be on campus for orientation, graduation, and final exams. HCU’s faculty is made up of elders, ministers, Bible class teachers, deacons, and missionaries, all of whom have personal experience in local ministry and missions. Similar to other Alabama online colleges, online students at HCU listen to recorded class presentations (audio and visual) accompanied by supplemental materials. Students access class presentations, assignments, tests, and grades on a web-based course management system. Distance learners can listen to recorded chapel messages through the school’s YouTube channel. Athens State offers more than 50 majors and degree programs, 40 minors, and various certificate programs at the school’s three colleges: Arts & Sciences, Education, and Business. Many of these programs can be completed entirely online. Bachelor's and master’s degree programs are available. The Bachelor of Science in Information Assurance prepares students to counter cyber security issues using risk management, security framework integration, incident response, disaster recovery, and acquisition lifecycle management. Students enrolled in the Bachelor of Science degree in Logistics and Supply Chain Management will study planning and forecasting demand for products and services. They’ll come to understand production cycles whereby raw materials become finished consumer products. Older than many other online colleges in Alabama, Athens State was founded in 1822, when it was known as Athens Female Academy; the school became coeducational in 1931. The school’s current four-year strategic plan calls for increased service to non-traditional populations using blended and distance learning that utilizes innovative course delivery methods. North Alabama’s motto, “Building Success through Discovery,” is fulfilled by providing its 7,000 students the tools they need to “imagine, investigate and communicate.” UNA stimulates intellectual growth through small, interactive classes, intensive faculty mentoring, and out-of-classroom experiences. Responding to employers’ calls for college graduates who are able to forge change and think outside traditional academic lines, UNA offers an individualized bachelor’s degree path with courses that cross traditional disciplinary lines. The popular Bachelor of Interdisciplinary Studies program is well suited for students whose career plans don’t fit a specific major/minor program. The degree offers customized studies with online, traditional, and hybrid courses. UNA offers 12 online bachelor’s, master’s, and education specialist degrees. Participation is expected online, just as it is in classrooms. Like other Alabama online colleges, distance learners have access to library resources electronically; requests can be made through phone research consultations. Orientation sessions, tutoring, online writing assistance, and academic counseling are also available. Online writing assistance can be used for homework assignments, resume building, or grad school application essays. Established in 1972 in Daphne, Alabama, the United States Sports Academy offers a bachelor's, master's, and doctoral degree in sports science and sports management. The $400 billion sports industry is an attractive career choice for many students, with more than half of the academy's alumni employed in the sports industry. USSA is one of the best options for students looking at attending one of the online schools in Alabama. The online programs at USSA are taught asynchronously, allowing students to complete coursework at their own pace. Classes are offered in a 16-week format, though active-duty military students are allowed 18 weeks to complete each course. Online classes are delivered through Canvas, an online learning platform where students can submit assignments, take exams, participate in virtual discussions, and communicate with their professors and fellow students. When its doors opened in 1967, AU-Montgomery was a commuter campus. Full-time students remain a big presence, but working and part-time students are attracted to Auburn for its small class sizes and 90 fields of study. The school’s colleges of Arts and Science, Education, Nursing, and Public Policy & Justice, support different types of learners. Degree, non-credit, and continuing education online courses are available with reduced tuition for out-of-state residents. Auburn offers traditional, online, and hybrid programs day, night, and weekends. The College of Education offers eight graduate degree online programs. At the College of Nursing, the RN to Bachelor of Science in Nursing, Medical Clinical Laboratory Science and graduate nursing programs are all fully online. Most College of Public Policy & Justice courses are online, including the Geographic Information Systems Certificate and Homeland Security & Emergency Management program. Students at Alabama online colleges, like Auburn, can feel confident knowing tech support, and math and writing tutoring is available. Located in Jacksonville, Alabama, JSU is considered one of the best online colleges in Alabama, offering a wide variety of distance learning options. The university offers online bachelor's, master's, and doctoral programs. Undergraduate program options include majors in integrated studies, family and consumer sciences, and emergency management. The 120-credit integrated studies program allows students to focus on two to three subject areas. Undergraduate students must complete a minimum of 30 credit hours directly from JSU and transfer students must be in good academic standing to receive credit. Online courses are taught by the same instructors that teach the on-campus courses. Online courses are delivered asynchronously, allowing students to complete coursework at their own pace. The university uses the online learning platforms Blackboard and Canvas to deliver online courses. JSU is regionally accredited by the Southern Association of Colleges and Schools Commission on Colleges. Troy University’s online blended programs give students options for learning. Founded in 1887 in Troy, Alabama, the school’s educational platform is truly global, with programs throughout Alabama, in seven southern states, at air bases in South Korea and Japan, through partnerships with universities in Vietnam and Malaysia, and through Troy Online. Reflecting the school’s longstanding ties to the U.S. military, Troy has offered extension courses on nearby bases since the 1950s, leading to today’s Troy Global Campus. As one of the best online colleges in Alabama, Troy partners with all military branches and welcomes adult learners looking to study abroad. Catering to students balancing full-time jobs and families, Troy Online offers 50+ undergraduate and 40+ graduate degrees. Most classes last for nine weeks. Online discussions through Blackboard and virtual collaborations help online students stay engaged, as does the Trojan Café, a virtual student union comprised of Troy students around the world. Troy’s libraries regularly sponsor lectures, programs, exhibits, and films. Formerly made up of an all-female student body, West Alabama did not begin accepting male students until after 1900; it remained a school for predominantly female students until the 1950s. Western Alabama’s emphasis is on traditional learners, but like many online colleges in Alabama, the school is also committed to the concept of lifelong learning and to serving non-traditional students. The Livingston-based university has expanded its use of technology to facilitate distance learning. Undergraduate and graduate degree programs are offered online through the colleges of business and technology, education, and liberal arts. The College of Natural Sciences and Mathematics also offers a Master of Science degree in Conservation Biology. UWA offers six terms a year that are eight weeks long in fall through spring and six weeks long during the summer. For online graduate programs, a full load is two classes per term. There are five online terms of eight weeks each, enabling students taking a full load each term to finish 30 credit hours in a year. Students can take one class a term or even skip a term at times, choosing to set their own pace. Most students earn their degree in about 18 months. Prospective students searching for the best online colleges in Alabama should consider the Alabama-Huntsville. As a leading research university with a global reputation, UAH is home to 8,400 students from over 80 countries. UAH’s campus includes 16 high-tech research centers and labs in the nation’s second largest research park. The complex attracts nearly $90 million in research spending. UAH offers 22 intellectually stimulating online programs using Blackboard, live streaming, and real-time videoconferencing. Distance students can view audio and video lectures alongside any materials used by faculty. Undergraduate and graduate degree programs are 100% online or hybrid with some on-campus meetings. There’s a 17:1 student to faculty ratio. Courses are offered year-round so students can complete the program in 18 months. Fall and spring semester courses are held in five-week installments. UAH was recognized by the Brookings Institution as the best university in the state based on graduates’ economic outcomes. (Graduates’ average $53,000 starting salary is higher than many.) Famous alumni include astronaut Dr. Jan Davis and Discovery Channel founder John Hendricks. Distance students can find over 30 online programs and hundreds of courses at Amridge to help them earn an associate’s, bachelor’s, master’s, or doctoral degree. Distance learning is the school’s primary instructional method for all its programs. The Montgomery, Alabama-based school was tapped as one of the first schools nationwide for a distance education initiative by the U.S. Department of Education. Like other online colleges in Alabama, students can take classes asynchronously. The school, committed to upholding Christian ideals, provides a nurturing learning environment with an outstanding faculty and state-of-the-art instructional technology. Instructors attend monthly workshops to stay up-to-date on online instructional technology. Classes are small, and all instructors are uniquely qualified to teach in their subject areas. Amridge is also one of the most affordable private schools in the United States, with over 90% of its student body qualifying for federal financial aid. More than 450 online courses and 12, 100% online bachelor and graduate degree programs (primarily in education, nursing and Interdisciplinary Studies) can be found at South Alabama in Mobile. Programs will appeal to first-time students, community college graduates and returning students. At the School of Nursing, where all graduate courses are online, students can finish online courses and complete clinical requirements in their home communities. The Master of Education in Elementary Education and the Master of Education in Educational Media are also entirely online. The 1,200-acre campus, which accommodates 16,000 students, is home to the USA Technology & Research Park, a 160-acre economic development incubator. USA’s health system includes two hospitals, the USA Mitchell Cancer Institute and the USA Physicians Group, all of which serve residents of the Gulf Coast region and as a training ground for future physicians and healthcare professionals. Mobile offered its first fully online degree program -- the Bachelor of Science in Marketplace Ministry -- in 2015. The school has expanded its distance learning program to include six undergraduate and four graduate programs. Online programs include an associate in general studies, a Bachelor of Business Administration, and a Master of Business Administration. Students enroll throughout the year in convenient eight-week sessions tailored to working adults who are starting or continuing their education. College-bound high school seniors can prepare by taking online summer classes. Unusual among Alabama online colleges, students attend classes Mondays through Thursdays; on Focus Fridays, they enrich their academic studies with internships, field experiences, missions, volunteerism, or academic clubs. Focus Fridays are designed to give students time to discover their professional callings and grow spiritually. This liberal arts and sciences school integrates the Christian faith with academic excellence. Faulkner, a faith-based institution, is located in Montgomery, but offers classes at campuses in Birmingham, Huntsville, and Mobile. It’s one of many Alabama online colleges helping students juggle family and work with flexible class options for distance learning. There are 23 online associate’s, bachelor’s, master’s, and doctoral programs. The school offers accelerated, fast-track schedules for its 3,000+ students and an average class size of 10-15 students. The online Bachelor of Science degree in Forensic Psychology is designed for students planning to work in law enforcement, a correctional facility, or the legal system. The online Ph.D. in Biblical Studies prepares scholars for careers in teaching, research, and the ministry. Students choose either an Old Testament or New Testament track and finish the program in four or five years. The online Sports Psychology bachelor’s degree is a good fit for young athletes attracted to study with a fitness focus or for students pursuing rehabilitation careers. Remaining true to its roots as a Christian college, Faulkner considers daily chapel, Bible classes, and evening devotionals as integral to the undergraduate experience. All undergraduates must complete 160 hours of volunteer service. Our affordability methodology considers value-driven metrics and ranks schools that have low tuition rates, as well as proven graduation rates and employment outcomes that provide a high ROI for students. For students in Alabama, there are plenty of opportunities to find an affordable program locally. While distance education provides more flexibility than an exclusively residential curriculum, there are still plenty of advantages to attending a local online college, including access to lower tuition prices and local scholarships. If you're considering going back to school, and are thinking about studying online, the following list of cheap accredited online colleges in Alabama will help you start your search. The oldest educational institution in Alabama, Athens State University was founded in 1822 to serve female students. With the lowest per-hour tuition rate in the state, Athens State is one of the most affordable online colleges in Alabama. The university currently serves 3,000 students at its campus in Athens. The school offers fully online undergraduate, graduate, and certificate programs, including degrees in religion, logistics and supply chain management, and accounting. Online students are eligible for the same financial aid opportunities as on-campus students, except for those enrolled in certificate programs. More than 160 scholarships are available annually through Athens State, its foundation, and its alumni association. The Transfer Student Success Center has counselors to assist transfer students with applying credits and obtaining an advisor. One of the most affordable Alabama universities, Heritage Christian University delivers Bible centered education in the Evangelical tradition. Heritage’s programs train students to be missionaries, teachers, counselors, and preachers. All on-campus degree programs are also available online through the Populi course management system. The school offers online associate and bachelor’s degrees in biblical studies, and master’s degrees in arts, ministry, or divinity. Graduate students are required to be on campus three times: during the introduction to graduate studies week, to take final exams, and to attend graduation. The campus is located in Florence, Alabama. Online students can access campus chapel services on the university’s YouTube channel and have opportunities to participate in the Christian Service Program. Founded in 1856 as the first land grant university in the South, Auburn University is one of the oldest colleges in Alabama. Its 12 schools and colleges serve approximately 28,000 undergraduate and graduate students. Auburn offers online bachelor’s degrees in accountancy, business, and computer science. The school’s online RN to BSN program is for licensed nurses seeking a bachelor’s degree. Auburn also offers online undergraduate classes in education, agriculture, liberal arts, and nutrition. Twenty-nine fully online graduate degrees are also available, including programs in library media, real estate development, finance, and environmental science. Proctoring services are required for online graduate exams. With 75 outreach programs within its schools and colleges, Auburn is recognized as a community engaged institution by the Carnegie Foundation. The University of Alabama at Birmingham serves more than 19,000 students on campus and through its distance learning programs. UAB’s eLearning division offers 12 online bachelor’s degrees, nine certificates, five doctoral degrees, and dozens of master’s degrees. UAB is a member of Quality Matters and the Online Learning Consortium, quality assurance organizations for online programs. Online students have access to tutorials, advisors, a math learning lab, and the campus writing center. Many of the eLearning degrees are fully online, including the bachelor’s degrees in finance and marketing. Other degrees are blended (50% online) or distance accessible (mostly online with a few on campus sessions). ProctorU is used for online test proctoring. The UAB Salute program offers fully online and blended degree programs to military service members and veterans. Up to 24 military transfer credits may be applied. Founded in 1950, The University of Alabama in Huntsville now has 21 online degree programs. UAH offers two online bachelor’s degrees in professional studies and nursing. All other programs are master’s or doctoral degrees. Most courses are asynchronous, but some require synchronous exams and activities. However, alternate arrangements can be made for students who cannot go to campus. Some courses require exam proctoring. Online students of this affordable Alabama university pay lower tuition rates than their on-campus peers. UAH is a member of the Southern Regional Education Board’s Electronic Campus Regional Reciprocity Agreement, so state authorization agreements should not be required for admittance. Since being selected as a distance education pilot by the US Department of Education in 1993, Amridge University has led the development of online learning. This affordable online college in Alabama offers undergraduate and graduate degrees solely online. Amridge University is a Christian institution affiliated with the Church of Christ. The school encourages students to provide community service to their families, vocations, churches, and neighborhoods. Scholarships are available to ministers, military members, and staff of Church of Christ institutions, and 90% of students receive financial aid. Reduced tuition rates are given to law enforcement and first responders. Located in Florence, the University of North Alabama is one of the most affordable online colleges in Alabama. The school offers online bachelor’s and master’s degrees in criminal justice, education, history, business, and nursing. Some courses have a hybrid format. Online classes are taken through the Canvas learning management platform. UNA is a member of the Southern Regional Education Board’s Electronic Campus Regional Reciprocity Agreement. It refers to the Quality Matters program to design and improve its online courses. Students without loans can use a monthly tuition payment plan. Transfer students with fewer than 24 credits must submit a high school transcript for admittance and transfer scholarships are available. All online students enjoy reduced tuition rates. Located in Mobile, the University of South Alabama offers more than 100 majors to approximately 16,000 students. The school currently offers four online undergraduate programs, including nursing and instructional design. Nine programs are available for online graduate students. BSN students can complete clinical requirements in their own communities or through the USA Health System. The online tuition rate is similar to the in-state, on-campus rate, but is much less than USA’s out-of-state resident rates. Scholarship opportunities are available, including scholarships for transfer students. Founded in 1831, the University of Alabama is located in Tuscaloosa. This top college in Alabama has graduated 15 Rhodes Scholars and achieved record enrollment in 2017. Online undergraduate programs include business, education, engineering, human environmental science, and nursing. The school also offers 30 graduate degrees, including law, psychology, and communications. These asynchronous online programs have the same instructors as on campus. Exam proctoring may be required. Some programs have higher tuition rates, including the EdD in higher education administration and the master’s in law. Financial aid and grants are available, including the Back to Bama grant program for students returning to complete a degree. UA is a program partner of GoArmyEd. Judson is the only women’s college in Alabama. Students enjoy a 9:1 student-to-faculty ratio. This Christian college was founded in 1838 and is located in Marion. Online students can be male or female. Students are provided six months to complete each online course. Undergraduate degrees require at least 128 semester hours. Undergraduate majors include business administration, criminal justice, religious studies, and Spanish. Online programs follow a cohort model and follow the on campus schedule. Undergraduate students can select from one of 11 minors, including church music and ministry skills. Students may receive credits for prior learning, military experience, and degree transfers. Around 96% of Judson graduates have a job or are in graduate school within a year of graduation. Founded in 1967 to support state government employees, Auburn University at Montgomery offers over 90 undergraduate and graduate degree programs. This affordable online college in Alabama provides low tuition rates for out-of-state online students; tuition for online programs is less than half the tuition for on campus programs. Alabama residents pay less than non-residents. Most online programs are master’s degrees, but some bachelor’s degrees are also available. AUM follows the eight-point Quality Matters standards for online course designs. Students transferring from community colleges may be eligible for scholarships and grants covering total tuition costs. AUM participates in the Community College of the Air Force General Education Mobile program. Founded as a teacher’s college in 1887, Troy University now has four campuses across Alabama. Troy Online provides several undergraduate degrees, including accounting, sport management, human services, and marketing. Graduate degrees include international relations, MBA programs, and psychology. Thesis and non-thesis tracks are available. Most online degree courses last nine weeks. Tuition discounts and application fee waivers are provided to full-time employees of Troy partners, including Broadway National Bank and the Alabama Department of Insurance. The Military and Family Scholarship benefits online students who are military service members and veterans. The TROY for Troops program provides counseling and support services to service members and their families. Since 1942, Faulkner University has been educating students in the liberal arts. This Christian college in Montgomery is affiliated with the Church of Christ. The school has 23 online degree programs including three associate degrees, an executive MBA, and two doctor of philosophy degrees. Programs can be accelerated for students who want to graduate quickly. The school has a 15:1 student-to-faculty ratio so that students can receive individualized attention. There is no application fee and 96% of students receive financial aid. Special benefits are provided to military service members and veterans. As a Christian institution, all students are encouraged to volunteer in their communities. The University of Mobile is a Christian institution affiliated with the Southern Baptist Convention. It has five online degree programs: an associate in general studies, a bachelor’s in psychology, a bachelor’s in Christian leadership and ministry, a master’s in education, and a master’s in nursing (family nurse practitioner). The school boasts a 13:1 student-to-faculty ratio. This is one of the affordable online colleges in Alabama offering several scholarships for academic excellence. Course sessions are typically eight weeks long. The GRE is not required for admission. Founded in 1835 as a church-supported school for female students, the University of West Alabama is now one of the largest and most affordable online colleges in Alabama. There are approximately 2,000 online students and more than 50 online programs. Bachelor’s and master’s degrees are offered in education, business, and psychology. Teacher, military, business, and transfer scholarships are available. At UWA, 80% of students receive financial aid. Online students enjoy one-on-one support from UWA advisors and staff throughout the duration of their programs. The main campus is located in Livingston. In the past decade, Alabama has prioritized the innovation and proliferation of distance learning throughout the state. Once ranked among the lowest-performing states for producing both high school and college graduate in 2003, Alabama has made dramatic changes through online education initiatives. ACCESS Distance Learning, started in 2006, provides rural students with resources and Advanced Placement courses comparable to those available in metropolitan areas. This momentum spread; those students who benefited from distance learning in high school now can continue their online education in college. In 2012, 16% (50,008) of the higher education students in Alabama attended distance education programs exclusively. Though higher education budgets and tuition rates have both fluctuated in Alabama, there have been signs of positive change in the past years. In 2012-2013, Alabama's annual tuition rate for public in-state institutions was $8,073, or roughly the same as the national average. The rate for private institutions, at $13,983, was significantly lower than the rest of the country. These numbers bode well for prospective online learners living in-state. The options for distance education have never been so diverse. 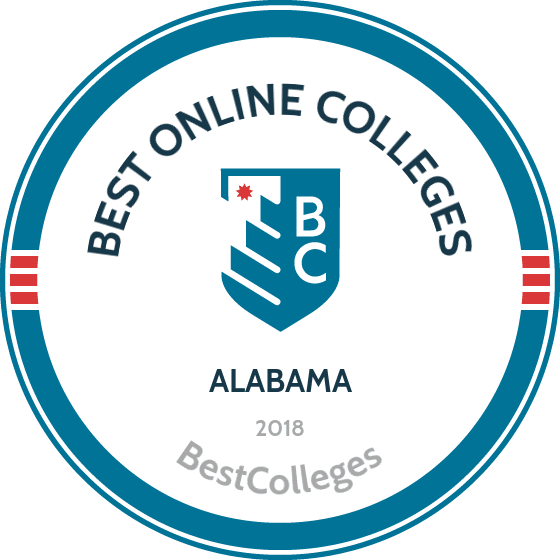 Browse our list of the best online colleges in Alabama for more insight into distance learning programs in this state. In Alabama, employment growth in this profession is strong. According to the Alabama Labor Market Information Division, long term projections show an increase of 15% in the total number of jobs between 2014 and 2024. Wages increased by 11% from 2011-2016. In Alabama, what were the top careers in 2016 for people who had a degree in business administration and management? Data source: Alabama Labor Market Information Division, Bureau of Labor Statistics. Data may not be available for every year. Data may not be available for every year. Employment growth in this profession is strong in Alabama. According to the Alabama Labor Market Information Division, long term projections show an increase of 26% in the total number of jobs between 2014 and 2024. Wages increased by 9% from 2011-2016. In 2016, what were the top careers in Alabama for people who had a degree in accounting? Employment growth in this profession is strong in Alabama. According to the Alabama Labor Market Information Division, long term projections show an increase of 187% in the total number of jobs between 2014 and 2024. Wages increased by 12% from 2011-2016. In Alabama, what were the top careers in 2016 for people who had a degree in psychology? In Alabama, employment growth in this profession is poor. According to the Alabama Labor Market Information Division, long term projections show a decrease of 6% in the total number of jobs between 2014 and 2024. Wages decreased by 1% from 2011-2016. In Alabama, what were the top careers in 2016 for people who had a degree in criminal justice/safety studies? Employment growth in this profession in Alabama is strong. According to the Alabama Labor Market Information Division, long term projections show an increase of 24% in the total number of jobs between 2014 and 2024. Wages increased by 2% from 2011-2016. In Alabama, what were the top careers in 2016 for people who had a degree in Registered Nursing?